As has been reported in Colombo Telegraph Dr. S. Dharshanan, Head of the Department of Music and a close relative of Jaffna VC Vasanthi Arasaratnam, was suspended from service without pay following numerous accusations of sexual harassment by his students and staff colleagues at the Ramanathan Academy of Fine Arts (RAFA). These accusations had been there from 2011 but the Council inquiries had asked the accusers to cooperate with their accuser. Action was forced only when numerous students complained in writing and were ready to riot, and one student was on the verge of committing suicide. The four years of licence to do anything with the women under his authority that the Council effectively gave Dr. Darshanan is now showing its consequences. These consequences are undermining the academic standards of the university. Darshanan is gone, albeit temporarily, but the effects of his stewardship of the Department of Music refuse to go away. His ghost is haunting the university. University admissions are based on the z-score, a normalized system of marks that allows a comparison of performance in subjects where it is easy to score with that in subjects where it is difficult to score. Unlike raw marks, the z-score yields a 1.0 for the medium of the raw marks and forms a common basis for comparison. Those on the merit lists for say engineering and medicine get a z-score of around 2, way off the norm on the upper side. In subjects that no one wants to do, even a z-score under 0.5 may merit admission. The RAFA is a place where the score is well off the norm in subjects like music that few want to do. As such the students too are from families where there is no culture of protesting when there is injustice. Generally the z-score system gives a good way to base admissions on. However, there are some subjects where it is claimed that aptitude is important and has to be measured as a part of the admission process. Thus Architecture is a subject where academics measure aptitude to depart from the strict use of the z-score and it is common and not surprising to see the children of academics being assessed to have high aptitude and getting admission. Although many recognize this as unfair, it is difficult to change because academics run the university system and want that system retained. However, keenly competitive subjects like medicine and engineering also demand aptitude but it is never assessed because favoritism there will result in a riot. A less noticed anomaly is in fine arts where also an aptitude assessment prevails. By itself, one cannot make a strong case against the practice of assessing aptitude in music. All that, however, has changed with the brazenness of Darshanan’s alleged marking for over 4 years. For example, Niththika Rasalingam with a z-score of 0.8072 has an A. Level grade of A in Carnatic Music, and a First Class Certificate in the Grade 1, Grade 2 and Grade 3 Examinations of the North Ceylon Oriental Music Society, and a Second Class in Grade 4. She was not selected because of Darshanan’s grading. Those with much lower AL grades in music have been admitted. 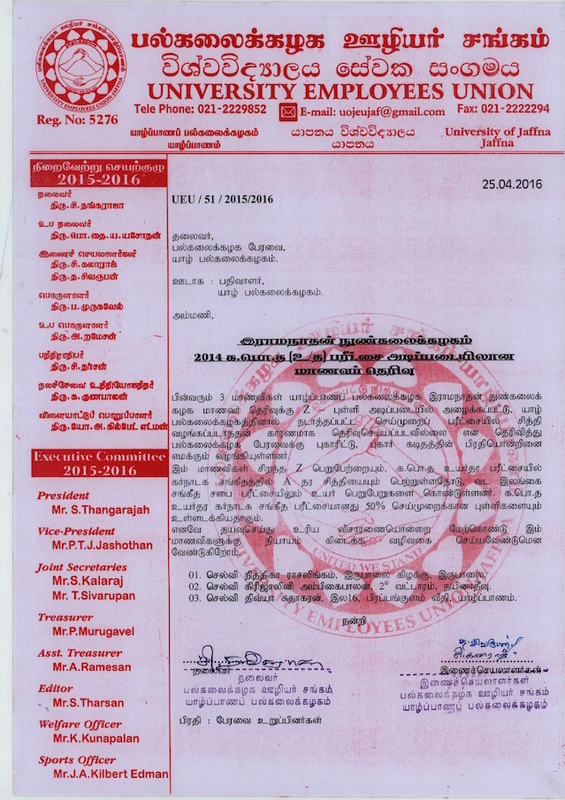 Fortunately for Niththika, Eastern University’s Swami Vipulananda Institute of Aesthetic Studies has admitted her. However, there are many others, especially from areas like Mannar who have good AL grades but have been denied admission based on Dharshanan assessing their aptitude in music. Those failing, it is alleged, are usually dark-skinned and lack the sophistication of city girls with good dental care. Many, the complainants say, were not even allowed to sing all the songs that usually make up an exam and were asked by Darshanan to go away part way through the exam. A member of the university Senate testifies that Darshanan had proposed two other lecturers as his co-examiners but the Dean of Arts at the time, Prof. V.P. Sivanathan, had disallowed it saying that one of the examiners had never sung professionally and both were under Dharshanan’s thumb. Yet, at the Senate where examiners are approved, the VC (who chairs the Senate) insisted on Dharshanan’s choice saying that the Department Head must decide. The rest is history. We grew up in Jaffna with a lot of respect for senior Mr. K. Nesiah’s contribution to education and were so glad when his son Dr. Devanesan Nesiah with experience as a Permanent Secretary was put on our Council. Devanesan raised many pertinent issues but was always rudely put down by the VC. Devanesan is a decent man and he cannot shout back like a street fighter in the VC’s style. So he has lapsed into silence. It is nearly a year and the VC is punishing him by not paying him his travel claims and meeting fees. The council is practically dead. When Devansesan can be shut down so easily like that, no one dares to protest about anything. The UGC has given the VC a blank check with impunity to do anything despite the unions documenting here abuses in recruitment. Nothing will happen to Darshanan. The students have no chance in this system. In the meantime the UGC has finalized admissions for the coming academic year. What can be done to give justice to poor rural children who were failed for being dark-skinned or having bad teeth because of their poverty? Mr. S. Kalaraj, a Joint Secretary of the Employees’ Union, hopes there will be an inquiry and that at least some students will be accommodated in filling vacancies. “It has gone on for too long, and we must make sure that at least next year we have a proper system in place,” he says.